Honors biology: Use your own method to extract DNA. Go to this link and record your lab. Important: Do research on methods of DNA extraction before coming to class on the day of this lab. Also read this lab activity and print it off for class use. Be prepared to use the computers in the class to answer some of the questions on the activity handout. 1. Place 1 gram or 1 teaspoon of raw wheat germ in a 50 ml test tube, beaker or jar. 2. Add 20 ml or 1 tablespoon of hot (50-60 °C) tap water and mix constantly for 3 minutes. 3. Add 1 ml or a scant 1/4 teaspoon of detergent and mix gently every minute for 5 minutes. Try not to create foam. 4. Use an eyedropper, pipette, or piece of paper towel to remove any foam from the top of the solution. 5. Tilt the test tube, beaker or jar at an angle. SLOWLY pour 14 ml or 1 tablespoon of alcohol down the side so that it forms a layer on top of the water/wheat germ/detergent solution. Do not mix the two layers together. DNA precipitates at the water-alcohol interface (the boundary between the water and the alcohol). Therefore, it is crucial to pour the alcohol very slowly so that it forms a layer on top of the water solution. If the alcohol mixes with the water, it will become too dilute and the DNA will not precipitate. 6. Let the test tube, beaker or jar sit for a few minutes. White, stringy, filmy DNA will begin to appear where the water and alcohol meet. You will usually see DNA precipitating from the solution at the water-alcohol interface as soon as you pour in the alcohol. If you let the preparation sit for 15 minutes or so, the DNA will float to the top of the alcohol. You can usually get more DNA to precipitate from the solution by using one of the DNA-collecting tools (such as a glass or paper clip hook) to gently lift the water solution up into the alcohol. 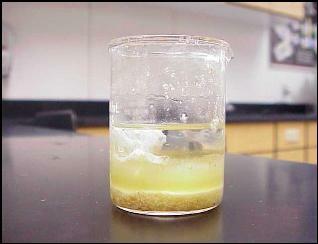 This allows more DNA to come in contact with the alcohol and precipitate. You may find it helpful to pour the water/detergent solution into a clean test tube, leaving behind the wheat germ, before adding the alcohol. 7. Use a glass or paper clip hook or a wooden stick to collect the DNA. If you want to keep the DNA, store it in 50 - 70% alcohol in a sealed tube or air-dry it on paper towels or filter paper.